Gary Schneider from THE TOXIC AVENGER and CLASS OF NUKE'EM HIGH talks with TV STORE ONLINE about the cult classic Troma film. TV STORE ONLINE: It's been almost 30 years since you shot THE TOXIC AVENGER  and CLASS OF NUKE'EM HIGH ...All these years later, what are your thoughts on the fact that these films have become so popular over the years and continued to gain a following to this day? 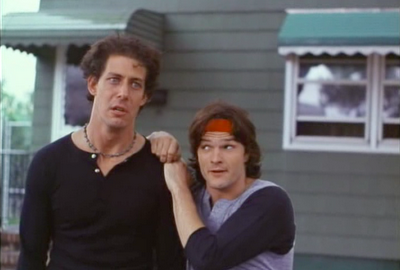 SCHNEIDER: What's interesting about it is that these movies have followed me around wherever I've gone. No matter what changes I've made in my own life, they are always there. So that's really great. It's really cool, and I like that about it. When we made the THE TOXIC AVENGER, I had just gotten out of school and TOXIE was the first thing I ever did. I was just going along for the ride. The fact that people still remember the films today and consider them cult classics is wonderful and surprising. TV STORE ONLINE: Coming out of New York...What was it like to be an actor there in the early 1980's? SCHNEIDER: I was a struggling actor just like everyone else. It wasn't easy, and I have a feeling that it is just as difficult today as it was back then. It might be more difficult today even. TV STORE ONLINE: Did you have audition for the part of "Bozo" in THE TOXIC AVENGER? SCHNEIDER: I did. I auditioned for Lloyd Kaufman and Michael Herz. I had heard about the casting call from the girlfriend of a friend of mine who was working in casting for Troma at the time. So I went down to Troma and it was a cattle call. There were hundreds of people there auditioning. I went in and read and I got called back. Then I got called back again. I think I got called back like eight times for "Bozo". It was emotionally exhausting. Then I heard that they had given the part to another actor. Vincent D'Onofrio had worked with Lloyd and Michael a year or two prior to this. I was really upset, because I really wanted that part. Then about two weeks later, I got a call from Troma telling me that they wanted me for the part, as Vincent D'Onofrio had dropped out to work on another film. TV STORE ONLINE: When you auditioned had you read the script or where you just given a scene or two? SCHNEIDER: They gave me some scenes. Or what are called "sides". I don't think I ever read the script in its entirety. TV STORE ONLINE: So what did you think about the whole concept when they first told what the film was going to be about? SCHNEIDER: At first, I didn't get the fact that this was a live action cartoon. All of the characters are over-the-top cartoon characters. The coolest thing about TOXIE was the fact that it had all of these big action car stunts in it. Not many independent films could afford that type of intense stuff. Basically, I didn't really know what to expect from it when I was cast. I just went along for the ride, and I tried to approach Bozo with what I had learned in acting school. I tried to give him some depth, even though he was a very one dimensional character. I gave Bozo a back story even. I just wanted to make the character work for me. SCHNEIDER: Laughing...I think it was pretty clear that Bozo was very angry on the outside. I approached it from the aspect that he had a lot of deep hurt on the inside. Dealing with that pain inside was his biggest obstacle in life. I also thought of him as a rabid dog. He was crazy and I pictured him always being like that. I saw him acting that way when he was sitting down to read the newspaper (even though he probably never read the paper) or standing in the bathroom as he was brushing his teeth. TV STORE ONLINE: Where was the Tromaville Health Club that you shot the film at? SCHNEIDER: It was in Brooklyn. 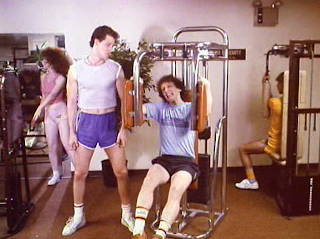 It was called the St. Georges Health Club. We took it over for a period of time and we would go in and shoot there all night long. TV STORE ONLINE: Did you and Lloyd Kaufman work together on some of that funny dialogue? Or was stuff like "You're stressing me Julie..." improvised by you? SCHNEIDER: The script for TOXIE has a lot of Lloyd Kaufman in it, but most of that great dialogue came from the screenwriter Joe Ritter. He was the one who came up with the "You're stressing me..." line. All the credit really goes to him for that stuff. 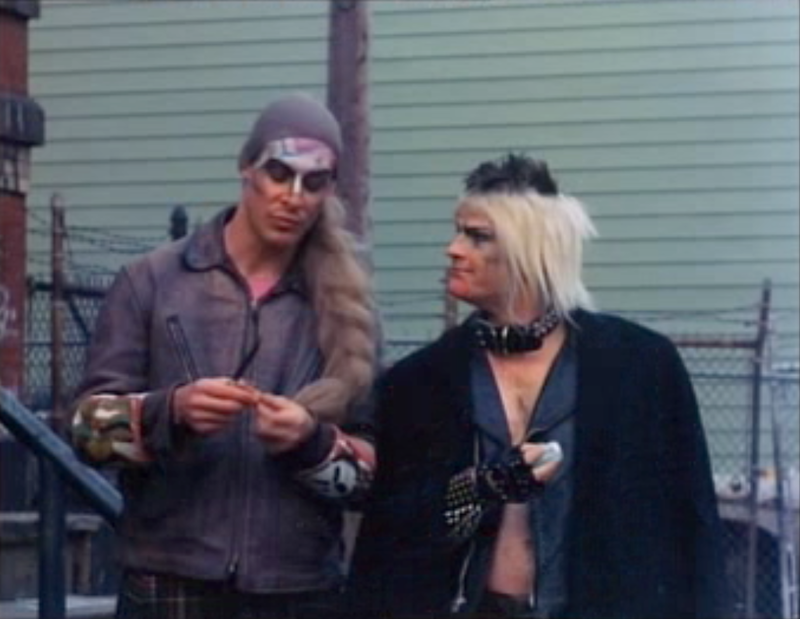 TV STORE ONLINE: Could you tell me about shooting that great scene were "Bozo" and "Slug" are in the Tromaville Health Club and their doing the sit-ups and passing each other a cigarette? TV STORE ONLINE: The scene in THE TOXIC AVENGER with Bozo and the others driving around at night and running over that little boy on the bike is pretty vicious..
SCHNEIDER: Supposedly, that scene or the idea for that scene was based on a real news story where some kids actually drove around and played what they called "Pedestrian Polo". I don't know to what degree these people did that, or if they actually killed anyone, but I know that is were either Lloyd or Joe got the idea for it. We shot that on my first night actually, and I can remember being really nervous now. It was fun because I was able to use my own nerves to help with the craziness of Bozo as he was driving over that little boy. TV STORE ONLINE: You said that at first you didn't catch on to the fact that you were playing a cartoon character...But while you were shooting, did you pick up on all of the black humor in the script? For example: After you've just run over the little boy, there is talk of running over another person and Slug says, "I can't. I gotta go home. I gotta go church in the morning..."
SCHNEIDER: Yeah, we all got that stuff. TV STORE ONLINE: Was TOXIE the usual Troma production...Were the actors helping out with lighting or doubling as Production Assistants? SCHNEIDER: No actually! I really appreciated that too. TV STORE ONLINE: Was there any life imitating art? Did Bozo or Slug hook up with any of the girls from the Tromaville Health Club off camera? SCHNEIDER: I didn't. 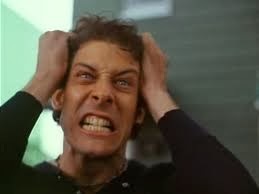 But Robert Pritchard, the actor who played Slug eventually got married to the actress who played his girlfriend in THE TOXIC AVENGER, Jennifer Babtist. TV STORE ONLINE: How about working with "Melvin The Mop Boy" actor Mark Torgl? SCHNEIDER: Mark was great. He worked a bunch on the production end for Troma. He was great as Melvin and I hope he enjoyed the experience as much as we enjoyed watching him play that part. TV STORE ONLINE: What are you memories of shooting CLASS OF NUKE'EM HIGH? 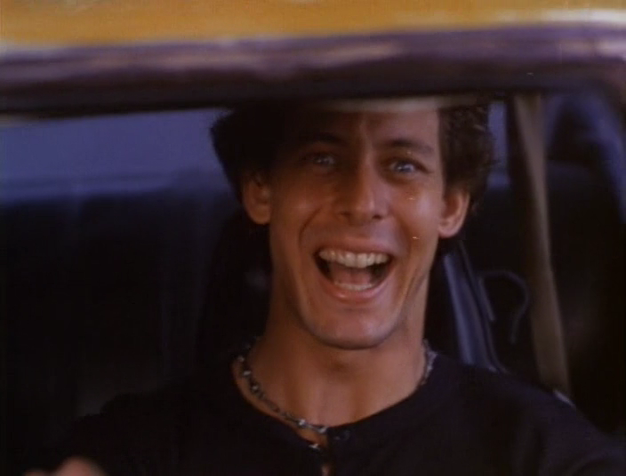 SCHNEIDER: NUKE'EM was originally going to be called ATOMIC HIGH SCHOOL. It was going to be written and directed by Richard Haines, who was the editor on THE TOXIC AVENGER. It was a completely different story about a family of cannibals. I was the young college-age son and I had a sister, and sometimes we'd bring dates home and have them for dinner...laughing It was supposed to be produced by Troma and Richard Haines was set to direct it. Something happened and I can't remember why this happened now, but Lloyd Kaufman and Michael Herz got more involved in the project and they took over the direction of it. I didn't audition for it. They just offered the part to me. I enjoyed it, because it was more relaxed and by then I was comfortable with how Lloyd and Michael worked. 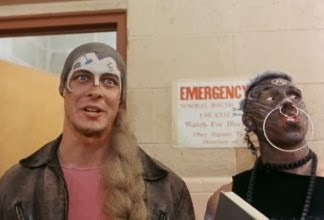 TV STORE ONLINE: Did you have any input into that crazy costume that you wear in NUKE'EM HIGH? SCHNEIDER: I didn't. It was funny. I was wearing long johns and a kilt. But I couldn't fit into the kilt. It didn't go completely around my waist. We didn't call it a kilt, we called it a "kill". If you see any pictures of me as that character you'll notice that the kilt doesn't go around me all the way. I got total enjoyment out of wearing that costume and it helped me to get into the character too. "Pete" was obviously a very different character than Bozo. I think Bozo would've ate him for lunch if the two ever crossed paths. SCHNEIDER: For sure. What I wore in TOXIE really helped me. I wore that chain around my neck in TOXIE. That was mine actually, but it really helped me with the character. TV STORE ONLINE: Where was the high school in CLASS OF NUKE'EM HIGH that you guys shot in? SCHNEIDER: It was in New Jersey. I can't remember the town it was in now. I think it was a closed down school, but I'm not sure now. TV STORE ONLINE: After TOXIE and NUKE'EM came out on VHS...Did you experience any sort of notoriety for your work in those films? TV STORE ONLINE: After BEACH BALLS you decided to stop acting? SCHNEIDER: After BEACH BALLS, I was cast in 1988 in a play in New York City called Tony n' Tina's Wedding. I was in that play from 1988 until 1993. It was the longest running play in the history of off-Broadway. In 1993, I decided that I didn't want to pursue acting anymore. I miss it today. I started a business, and along with my partner, we supplied entertainment at children's events for fourteen years. We would book clowns and magicians for parties and perform ourselves as well. In THE TOXIC AVENGER I played Bozo, and when my partner and I would go out and do a show I would play this sort of clown. So I've come full circle in some respects I think.